Everything 'up north' should be - Our condo is private, clean, comfortable, and conveniently located on the property of the Homestead Resort. This means you are just minutes from the beach, bike trail, groomed hiking and ski trails, and the ski village. Just down the road is Glen Arbor, Glen Lakes and the Sleeping Bear Dunes. Glen Arbor offers resort shopping and a choice of delightful restaurants. Spend an afternoon boating crystal clear Glen Lake or kayaking the Crystal River. A trip up north wouldn't be complete without the challenge of climbing the Sleeping Bear Dunes or a visit to 'fishtown,' Leland. The new Heritage trail is perfect for a bike ride. From our villa you are just a scenic drive to all the other Leelanau Peninsula treasures- orchards, vineyards, golf courses, horse trails, historic sites and casinos. Come, Be Our Guests. 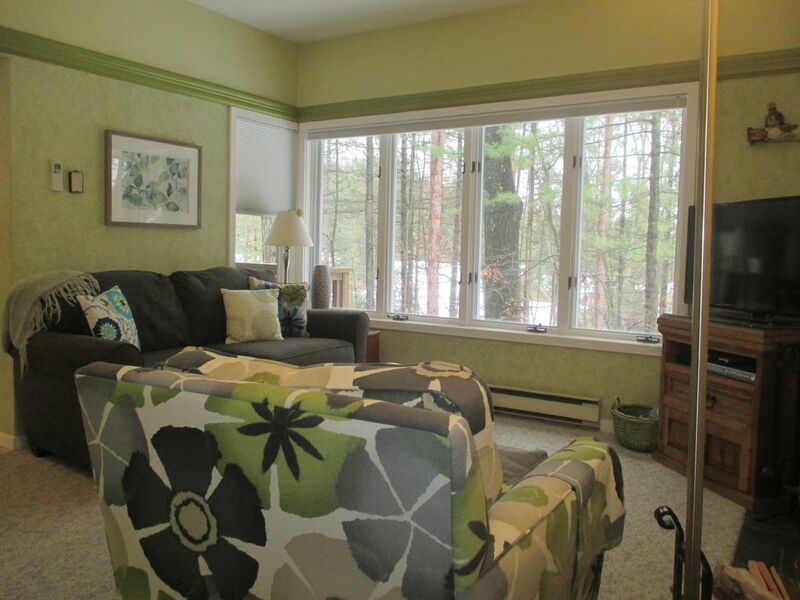 Tucked in the northwoods, renters comment on how private, clean, and comfortable villa is. Easy 3-step entry welcomes you to relax in the great north woods. Start the morning with the birds and a cup of coffee on our wooden deck. After a walk through the woods, a day at the beach, a game of golf, or a drive around the peninsula visiting wineries, return to our air conditioned villa . Visiting in the cooler months? Settle down to a fire in the fireplace and a good movie on the DVD player. Ready for bed, tuck yourself in to comfort in our king-size sleigh bed and dream about returning. Located between the reception center and the ski village of the property of the Homestead Resort, our villa is a short walk to Lake Michigan, the entrance to the Bay View trail, Cavanaugh's deli and Nonnie's restaurant. Glen Arbor: Just 40 minutes east of Traverse City is the quaint town of Glen Arbor. Nestled on the shores of Lake Michigan, it's a destination spot in any season. Summer attracts Glen Lake & Lake Michigan boaters, sailors, hikers, dune climbers, cyclists and sun worshipers. The restaurants are open late luring you in with their fare. Some even have live nightly entertainment. The shop doors are open enticing you to buy everything from Cherry wine to carved cherry wood tables. Plan accordingly and you can catch an art, polka, or jazz festival. Fall brings a quietness to the town. It's a perfect time to take a color tour through the scenic hills, catch a game of golf, or walk through any number of groomed trails. Perhaps you'll spot a deer, porcupine, red fox, or raccoon. We have. Winter fun begins on the down-hill slopes or cross-country trails. When spring arrives, everyone celebrates by hunting Morrell mushrooms and spotting Trillium as they poke through the winter leaves. Come, be our guests. Area Attractions: Come, discover all of the Leelanau Peninsula treasures with us. Be awed by the Sleeping Bear Dunes or Lake Michigan or marvel at the beauty of a wildflower growing along one of the many groomed hiking trails. Tucked throughout the peninsula are vineyards, wineries, golf courses, lakes and scenic lookouts. For the nostalgic is Leland, a turn-of-the century fish town still practicing its trade but expanded to welcome inquisitive visitors. Empire too boasts a maritime museum depicting the wrath and splendor of Lake Michigan travel. Why you can even find a home-made cheese shop and family drive-in theater. For the modern sophisticate is Traverse City, just east on M-72. North of TC is the casino at Peshawbeston. To the south is fine arts school at Interlochen which hosts local and international artists throughout the year. No matter where you go in the area, there is something to do and something to see. So come, be our guest and experience all that 'Up North' was meant to be. * Please note that we are not a part of the Homestead Resort and therefore do not have access to the Resort pools. To have access to the pools you must rent through the Homestead Resort. Outdoor setting and convenient location to so many 'up north' opportunities - hiking, boating, biking, swimming, skiing, horse back riding, fishing, dune climbing, vineyards, shops, restaurants. Limited steps for ease of access. Walk-in shower Fully equipped kitchen - oven, frig, microwave oven, dishwasher. Drop leaf table in living room comfortably seats 4. Two chairs in the bedroom and two on the deck. This condo was great for a weekend get-away with my young son and would be great for two people. It was clean and comfortable, including the bed, which is something I'm always concerned about in a rental The only downside would be the lack of a dining table and chairs if you plan to eat a lot of meals in the condo, which we didn't. So glad to be able to share our condo with you and your son. Glen Arbor and the surrounding Leelanau Penninsula is a great place to explore in any season. Sorry that you must have missed in my welcome email under “condo particulars” that the drop leaf table in the livingroom opens up to comfortably seat 4 or more. There are two chairs in the bedroom and additional seats on the patio. The place is small but can sleep 4, so we have to be creative. We hope to have you back so you can experience kayaking down the Crystal River, hiking the many trails, and of course, swimming in Lake Michigan. This VRBO condo is perfect for a couple! It is nestled in the Homestead Resort, which allows one to take advantage of those amenities. It was very clean and cozy! We definitely plan on returning in the summer! Enjoyed our stay. Condo was clean and comfortable Sitting around a cozy fire after a long chilly day out wandering the countryside was very nice. Our only advice to owners would be to invest in new sheets and pillows. They have seen there better days. Overall, nice stay in nice condo, pleasantly surprised! Leelanau county is a great place to explore any time of the year. The fireplace adds to the experience during those cool fall and winter months. We were glad to share it with you. The pillows, while they may not be what you are accustomed to, are brand new. The sheets on the other hand, are on our spring list of replacement items. Thank you for sharing your thoughts with us. We look forward to perhaps hosting you again in the future. This clean, newly updated villa was perfect for our anniversary getaway. This was our first VRBO experience because I’ve always been hesitant to try. We had a great experience! It was much colder than anticipated, so it was great having a wood burning fireplace. This villa is close to Glen Arbor shops and restaurants and not far from Sleeping Bear Dunes State Park. Beautiful scenery... the fall colors were gorgeous! If visiting in the fall be mindful that restaurants and stores have seasonal hours and most close early. We will definitely be back again! We had a great trip up north, and enjoyed the coziness of this cute little condo! This condo is just beautiful. Love the updated kitchen and bath. Nice big shower, two sinks and handy washer and dryer. Comfortable furniture in the living space and love the king bed. Great location and plenty of privacy in the woods. We had a spectacular week and will return. Just east of Traverse Ctiy is the quaint town of Glen Arbor, home of the Homestead Resort. Tucked in the north wood shores of Lake Michigan, it is a perfect get-away destination in any season. Summer fun begins on the shores of Lake Michigan and extends through miles of groomed hiking trails woven throughout the peninsula. The rolling hills and dunes attract bikers and dune climbers from around the country. Our villa is only 5 miles from famous Sleeping Bear Dunes. There is also boating, sailing, fishing, canoeing, and 'rump bumping.' The hills are gorgeous in the fall and salmon fishing exhilarating. Cozy up to the fireplace and plug in a DVD this winter after your fun on the slopes or trails. Then look forward to coming back in the spring to hunt Morell mushrooms and spot the Trillium poking through the winter leaves. Come, stay with us and enjoy all that 'up north' was meant to be. If you are familiar with the Homestead resort, our villa is a South Village unit located between the reception center and the ski village. Holiday prices may vary. Please contact owner for holiday rates. There is a minimum stay of three nights on holiday stays. PayPal and personal checks accepted. Cancellation Policy A 25% deposit is required to hold your reservation. The balance or a cancellation is due 30 days prior to your stay. A cancellation after that time will require the following cancellation fees:20% of the total rental cost if between 22-30 days; 40% of total rental cost if between 11-21 days; 80% of total rental cost if 10 days or less. Any on-line charges incured will be charged back to the guest.